We recently got chance to finish our game of the “Where’s Merville?” scenario from Red Devils in the night. It was Dave’s phase. Typically at this point, he rolled consecutive phases. 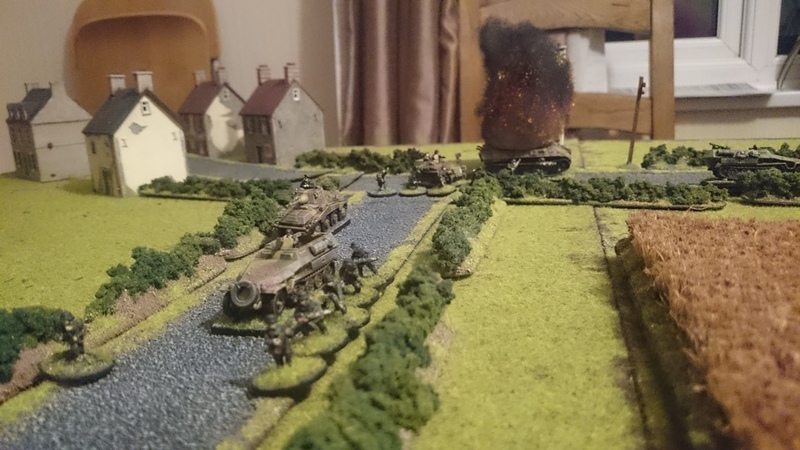 The Paras PIAT team couldn’t believe their luck at being presented with such a juicy target, and fired on the Panther at point-blank range. The PIAT round seemed to ricochet off the gun mantel and there was a loud explosion, which resulted in the driver being killed. The PIAT, even at close range, rolls only 7 dice – the Panther has 11 armour, so I wasn’t too worried. Dave rolled 12 to hit on 2D6, which counts as a critical hit and adds 3 dice to his armour penetration (the round has hit a weak point) – since the Panther is an Ausf. D model, we decided that the round had hit the lower gun mantel and deflected down (the ‘shot trap’ design issue on the Panther). Rather appropriately, the subsequent damage roll killed the driver. With the rest of the phase, a couple of Para units continued to move around and look for cover. On the downside, the Panther was actually a Command Tank, and was therefore carrying my Senior Officer. His death, plus the loss of the tank, caused my Force Morale to fall by 3. …which caused my Force Morale to drop by another point. The 234/1 Armoured car, which was parked at the cross roads, attempted to exact revenge for the death of the Panther, but combined shots with its machine gun and 20mm Cannon only inflicted mild shock. At this point, the Panzer Grenadiers were busy de-bussing from the half-tracks and moving towards the road junction, whilst the remaining vehicles: a 250 Half-Track (containing my other Senior Leader) and a Puma had arrived on the table. I was very thankful that the Paras did not have Mortar support, otherwise I’d have been in a world of hurt! I think my reasoning was (belatedly) sound, but – as you will see – this probably just ended up providing more targets for the Paras! The Germans continued their (now) cautious advance up both roads, with an armoured car and half-track providing cover for an Infantry squad on each road. A couple of Paras attacked the Hanomag on road, dodging through a hail of machine gun bullets to throw Hawkins grenades at the vehicle. Whilst this was happening, the 234/1, having left the board, radioed to confirm that the left-hand road was the correct way. (this was randomly determined – I rolled a ‘2’ on a D6. 3+, and it would have been the other road) The Major in the 250 Half-track passed the message around, and all units started to converge on the left-hand road – The Puma reversing whilst the Grenadiers cut through a gap in the hedge. A Para once again attempted to place a Hawkins grenade on a 251…and was promptly shot dead for his trouble. However, this was catching on all around, as another Para dropped a Gammon Bomb over the side of the other half-track, which caused the crew some distress, but no further damage. …one attack finally succeeded. The half-track was knocked out, and the crew ran for their lives. The attack killed the driver and pinned the crew in the vehicle, but at the cost of the Para team being broken themselves. Things were getting desperate, as the Germans tried to force their way through the Paras blocking their way. As the Germans pushed forwards, their rear was threatened by another squad – the Puma tried to engage them, but with little effect. Dave ended the turn with a CoC dice before the squad could rally, and the Junior Leader routed from the table. My Force Morale had plummeted to 1, and I only had three active units left on the table – the 251 in the cornfield, the Puma on the road and the 250, which was trying to get away. One last roll of the dice, but the driver of the 250 half-track simply could not get the vehicle into high gear, and it continued to crawl along the road. Another Para with a gammon bomb, and the second 251 was knocked out. Victory to the Paras! …and the Paras were still in good order. Final result – Germans 0 : 7 British. This was a massively hard fought battle, one which almost resulted in a German victory. ‘All’ I, as the German player, had to do was to get either the Panther or the SdkFz 250 off the correct road. Once I had identified the correct road, I had to make sure the way was clear, so engaging in a firefight with the Pars and getting them to expend all their PIAT rounds seemed like the way forward. It may well have worked, if I wasn’t so bad at rolling movement dice! At the end, I had to move the 250 half-track about 40 inches to get it off the board, but managed no more than 24, despite attempting to move at full speed twice. However, such a victory would have been Pyrric indeed, as the majority of my force was destroyed by the Paras, who made great use of their Gammon Bombs and Hawking Grenades. Given the dense terrain and lack of visibility, these proved deadly as I simply couldn’t stop the Paras from getting in range – although, thinking about it even as I write this report, the fact that they had to approach the vehicles within 4″ of an accompanying Infantry squad means that they should have perhaps had to engage the troops in close combat first, rather than being able to attack the vehicle and ignoring the infantry, so we may well have played that incorrectly. The result was very Hollywood – with Paras dodging fire and tossing grenades in open half-tracks left, right and centre. Fun, but in hindsight, we may have got that completely wrong. Ironically, the game also proved what a nightmare it is moving armour through bocage when it’s defended by infantry. It’s strange that it’s I, as the Germans, were the ones who were taught that lesson.